The cleaning and tidying goes in very small bursts. I set out, for one of the veterans groups who takes donations, two grocery bags and a small box of stuff on Monday. I have not done any further purging beyond some box and paper recycling. I battled a rather large RA flare at the end of February and feel a need to clean the house; dust, sweep and wash floors. I was going to start on that task at the end of February but spent the weekend in bed. This happens about every 3-4 months so I'm "used" to it. But it sets me backwards in getting things done which frustrates me and that adds mental stress which triggers a flare which makes me tired so I take a nap which means; well, you get it. But I was moving things around to make room for other things and stumbled upon this. 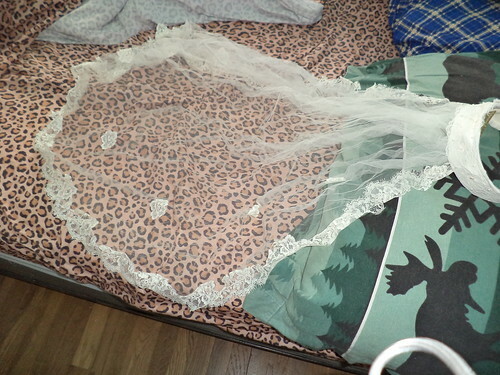 This is the veil from my wedding outfit. It was handmade by the woman who owned the store from which I bought my dress. Finding this reminded me the dress itself is in a plastic container in the basement. I don't know what to do with either of these. They date from 1978. Do I put them on eBay? Would they actually sell? I don't think donating them anywhere would work. Who would want them? I don't want them. Both have been cleaned and are in excellent condition, but I'm at a loss here. Forbes.com had an excellent article about the lack of interest in collectibles and general accumulations of life. "Sorry, Nobody Wants Your Parents' Stuff" made me look around my house and do a more critical evaluation of what I have. While I should not surround myself exclusively with things my daughter will find value in, I need to be happy in my space, if I no longer want it, there's little chance she's going to want it, either. This is a clear example of something which may have zero value. How does one get rid of something like this? So, I'm struggling with this dilemma. There are some things, like blankets, coffee mugs, clothing, which I can get rid of with ease and which a group willing to take "discards" like that would find value. Some things, such as a wedding dress and veil from 1978, I just don't know there's any kind of market for and it feels wrong to dump it on them. Suggestions?